Celestial Reflections: Does James Ray Disprove the Law of Attraction? 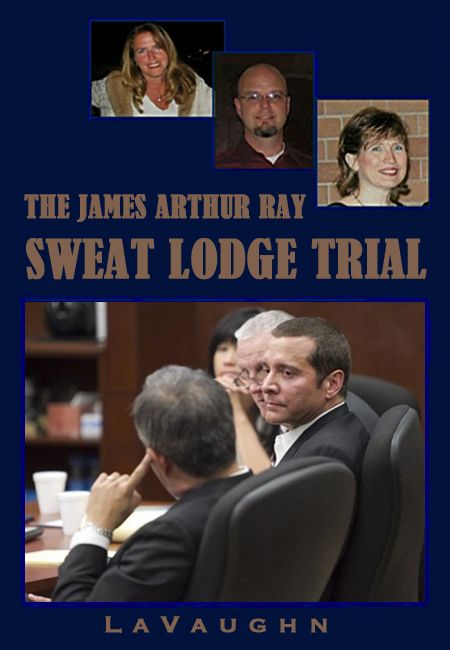 Ultimately, then, the James Ray trial doesn't say anything about the truth of the law of attraction. It only says something about Ray: That if he does sincerely believe in the power of this universal principle, he somehow didn't put it into practice as well as he might have. But if the law of attraction is a universal principle as basic as gravity, everything that occurs should say something about the truth of it. We don't put universal principles into practice and we don't have to believe in them. If we fail to practice the law of gravity well, we don't go floating off into space. James Ray also tried to dodge the harsh judgment implied by his own belief system. Shortly after being indicted and with his financial fortune apparently evaporating, he took to his Twitter account and started soundbite philosophizing about why the simple cause and effect formula he'd been propounding for years wasn't simple at all. And then he told us that we'd always been at war with Eastasia. So, here is a teacher who was part of The Secret movie, who understands law of attraction not even in the slightest, who held seminars for the purpose of seeing how much discomfort you can endure without dying. Deprivation in the desert, deprivation without food, deprivation without air, high temperatures in the sweat lodge; in other words, see how much you can endure. Now law of attraction brings the leader of this group right now to jail where he is being deprived of all of the things, all of the things that are important to feeling good. In other words law of attraction is this powerful, powerful, powerful, powerful law that says you get what you think about and what you think about is evidenced by the way you are feeling in the moment. And when you've decided that you’re going to struggle your way to joy, the joy never comes. So, that's what we say. You can't have it both ways. You cannot suffer your way to joy. And you cannot joy your way to suffering. There is a certain seductiveness to this logic. It's viscerally satisfying, in the way a guilty verdict would be. It sounds just and we all want to think that everything that happens here is ultimately just. But it isn't really as simple as she/he presents it to be. Universal principles aren't about good and bad. They operate in wholeness. That's why they're called universal. (universe = one turn) At least that's how I, as a mystical thinker, must view it. In the Abraham/Hicks scenario, joy and suffering are simply incompatible. We have to choose one or the other. But life is really kind of a mixed bag. And it's going to be a mixed bag no matter how we feel about it; how "positive" or "negative" we are about the whole thing. The other day I wrote about how law of attraction proponents always want to put the things they don't like "over there." They're all about creating distance rather than honoring everything we encounter as our reflection. Landau, in the quote above, does that. What's happened to Ray doesn't say anything about her beloved law of attraction, or, by extension, about Landau. It only says something about James Ray. Mystical thought says, if I'm aware of who James Ray is, he does say something about me. He is my reflection. And the work for me is to figure out what I need to learn from this series of events that has captured my attention. The Hicks material, likewise, is all about distancing yourself from uncomfortable reflections. From the same video comes this rather disturbing lesson for "healers." The healer, it says, is supposed to be in a "vortex" of wellness thinking that the sick people live outside of... because of all their "deprivation" thoughts. But the thing that's tricky about someone that's inside the vortex convincing someone outside the vortex is that if they're very far outside the vortex, they can't hear you. So most healers do traipse outside the vortex to try to help them but then they can't help them because they're outside the vortex. So this has been the conundrum that healers have been experiencing for a very long time. Most healers eventually are trained by the sick people into their vibration rather than training the sick people into their vibration… And we say, in order for you to be of any value to anyone you have to separate yourself from the discordant beliefs that they hold about sickness... So what happens, people in need, they'll drag you out every time. They'll say, "I need you. Be here with me. You've gotta be there for me." So you can't just be there for the person; the whole person. You have to be there for one half of this very polarized construction that almost animates wellness and illness into conscious entities. You can't possibly accept people for who they are and where they are in their process. You must know it so unequivocally that no matter what the tests show, that no matter what the x-rays show, that no matter what the attitude is, that no matter what the manifestation is, you have to know the potential for wellness is greater than the potential for illness. And as you hold fast to that knowledge and you practice it every day of your life relative to you and to everything that you see, eventually that vibration will be so powerful within you, that with anyone stands before you with their problem or their illness, you will have risen so far above it. And many of them will say, "Hey man, you're not there for me." And your answer must be to them, whether they hear it or not, "I'm there for you. I'm there where your recovery is. I'm there where your value is. I'm there where who you really are is. I'm there where your strength and vitality are. I practice my thoughts of your resiliency. I practice my thoughts of your well-being. I practice them incessantly. In fact I have trained myself so that I never allow myself to focus upon your plight or your illness even for a moment." And they will say, "Well, it's not really helping very much." Well, that last sentence is at least honest... if narcissistic. Note that the entire lecture is about the healer imposing their will, their vision, their ego, onto the ailing person. Acknowledging and honoring where that other person is in the moment is out of the question. What if that illness is perfectly appropriate for them? What if it's teaching them something they need to learn? There is nothing in this channeling about the transformational opportunities in illness. What if it's simply their time to die; the one that they have chosen? They should die without your fully attentive presence and compassion? This is the kind lunacy that ensues when we construct a formulation as simple as: health good, illness bad. We start putting all these judgments, not only around the illness, but around the people who deign to get sick. We treat them like by being sick they're doing something wrong. Illness, according to Abraham/Hicks, is an "attitude problem." It's "about mood." So if people who are exposed to radioactive iodine (think: Fukushima) start getting thyroid cancer, they wouldn't actually be getting sick because of all that radiation. It would be because they're just so negative. So if they cheer up, presumably, all will be well. And nowhere in this is any attention to what lessons the healer is supposed to be learning from the experience of the person before us, who, like it or not, is our reflection. Underlying this attractive idea is what mystics have been teaching for millennia. It is that all things reflect all other things. That it cannot be otherwise because we are, in fact, one with everything around us. This means that the people you meet are not "like" you ("like attracts like"). They are you. What that means is that James Ray is me and I am James Ray. It profits me not at all to wag my finger and pass judgment on how his thoughts manifested his circumstances. As a mystical thinker, the question I must ponder is what James Ray and the tragedy he materially created, reflects in me. That doesn't make me, as an individual, a reckless, wannabe shaman who cooked people to death. I know for a fact that I am not. But it does mean that somewhere in me is some tiny piece that reflects that somehow. It could be a snippet of a past life. It could be some piece of childhood memory. But somewhere, in me, is something that I haven't completed and that I need to forgive and release. What strikes me as so odd in Landau's article is the implication that Ray's being on trial is something that "happened" to him. Somehow this mysterious turn of events might call into question her entire philosophical framework because someone who's made a career out of the law of attraction should maybe have better disciplined thoughts and feelings than that. But Ray didn't just "law of attract" a catastrophe. This wasn't a tornado or an earthquake. This is something he created through his own actions (and omissions). Whether our very earthly, human concept of justice is to be satisfied when the James Ray trial goes to verdict will be up to a jury of his peers. Throughout this trial I have eagerly awaited "LaVaughn's take" on things. In fact, often when I see that you have posted an update, I snuggle in with my coffee and my cat and SO enjoy that time giggling over your wit, pondering your insight and appreciating your humility. I have asked (of myself) hundreds of times... "why the fascination with how this trial plays out?" and what is the reflection of JAR in me? I have to say LaVaughn, this is one of your more brilliant posts. You have captured (in words) what I have been trying to sort out for so long about practicing the "law of attraction". Many of the mainstream interpretations have felt too black and white, right and wrong, cut and dried, all or nothing. I feel it appeals to this polarized-good-camp-bad-camp thinking that puts things neatly into boxes and claims them as truth. I just find it all so "wanting"... I mean, where is the middle ground in this? In witnessing JAR demonstrate a lack of compassion for people in such a public way, I am more in touch with MY compassion. In witnessing the outcomes of forcing, pushing and brutally admonishing people to understand their "true nature" and therefore create more "abundance" in their life, I am more in touch with the power of grace, allowance, and acceptance. In witnessing the JAR's lack of integrity, I am more in tune with the importance of my own integrity. In witnessing the fruits of JAR's choices, I am more aware of the fruits of my choices... some to be celebrated and some to be re-decided. For me, JAR is a teacher of compassion, power, grace and integrity in the fact that he DOES NOT seem to demonstrate these qualities and practices. For me, JAR is a teacher by ommission... not example. Fascinating, thought provoking post. Thank you. I like your response Brenda. I too ask myself: Why am I so captivated with this trial and what is the refection of JAR in me? In JAR, I see the polar opposite of myself regarding responsibility: acting overly responsible for my family, friends and patients. Both extremes are unhealthy. I'm slowly learning how to find a middle ground between black and white, right and wrong. Having zero responsibility and caring for people, is just as limiting as having an excess. Having attended sweat lodge ceremonies on a regular basis for a decade, I sometimes wonder what I would have done in that situation. I have a strong inclination to follow authority, yet a strong inclination to take responsibility for others. Jerrry Hicks has been diagnosed with leukemia and is using conventional medicine (chemotherapy) for his illness. I hope Esther doesn't practice what she preaches with regards to her husband's illness. I can't imagine going through that and people telling me that they will only be there for me when I'm better. Very sad. I wish him a healthy recovery. @theoreticalgrrrl You know it's funny. As I was writing up this post, in the back of my mind I was wodering what on earth the Hickses would make of a cancer diagnosis should they after have to face one. (I didn't say it was ha ha funny.) I couldn't help contemplating how would they explain that based on their belief system? How would they treat it? What would they say about it? Have they said anything about it publicly? Has Abraham addressed it in a channeling session? Anyway, you're right. It's very,very sad. And I do hope he's receiving some genuine compassion and care in addition to the brutality of chemotherapy. @Brenda @Kathy -- Thank-you so much for these wonderful comments. I've read them several times and I've been really moved by your open-heartedness and honesty. @katiecool I've been glad to see your comments here and there. You're missed when you're not around but I do understand. LaVauhgn, your blogs have been amazing and I thank-you. I notice JAR colleague, john Assaraf is seeking feedback about the JAR trial. He looks just like JAR---what's his deal? @billiem, Yes. Yes. I'm aware that he's gotten into the fray. ;-) No idea what his deal is, though. He wasn't even on my radar until I learned of his recent bankruptcy filing. But, hey, at least he acknowledges that Ray has some culpability. And now, a jury has too. First time I read your blog. I am an expert in the Abraham teachings and it was very funny to read your confusion and even more funny to read you consider yourself a "Mystic" he he very funny. The material produced by Abraham is too much extense. If you really want to produce an opinion about it I think you should listen to the material for some five years, try to put the teachings into practice and then, and only then, give us your must required opinion. In the meantime, your writing will be filled by pure stupidity , confusion and imbecility. Thank you. Superxavier, Why don't you show me where I said I consider myself a Mystic. Then tell me again that I should familiarize myself better with material before I respond to it. You're welcome. Thanks for writing this I found it very insightful :) and although I always felt The secret and Esther hicks were BS I could never pin point exactly why. For me anyone trying to make a lot of $$$ on universal laws that aren't so much of a " secret" if you actually looked into it lol is a scammer and not just that but it can litteraly ruin your life. I have a family member that's totally into this and he divorced his wife and quit his job. Now he is mostly alone no family and struggling financially and his kids dont really talk to him yet he actually gave me the book for Xmas ROFL !! And pushes Abraham on me, I told him I had a problem with anyone talking about spirituality and also how to get money with it -it just doesn't click in my head no matter what they argue. Money is vibration also its a tool yes but why are you trying to get me so attached to it selling it to me as a form of spirituality? Lol oh I forgot to mention I was told by my family member that gave me that awesome Xmas gift lol that I had an abundance block if I had a problem with " the secret " OK yet I have more money than him in my bank account than him lol oh and BTW maybe yes you're trying to heal something from the past and need to release it or maybe it was a lesson learned so you can call out people on their BS lol people need to hear this stuff seriously! I am also very troubled by the pecuniary focus of the LOA stuff. But that's why it sells. Most people feel financially unsafe, now more than ever, so telling people they can control all that with their minds is great way to make a living. And the mass media loves it because it's very pro-consumerism. It's a win-win. Until it all goes horribly wrong and much of it has. "I have eagerly awaited "LaVaughn's take" on things. In fact, often when I see that you have posted an update, I snuggle in with my coffee and my cat and SO enjoy that time giggling over your wit, pondering your insight and appreciating your humility." Brenda said it perfectly for me! Noncast, noncast, noncast!!! Actually, you write them faster than I can process the previous ones. There are still some links I want to have another look at and contemplate on those well-crafted paragraphs of yours from the last two installments. So take your time :-) The subject is not easy and I'm still updating on the new developments of this tragic case. But the anticipation is building up, I imagine it's going to be something powerful (no pressure lol ;-). Ps. Loved this article too, btw. I never cared much for 'The Secret', and James Ray in particular seemed like such a hustler that it's hard for me to imagine how anyone could have trusted his 'leadership' over their own instincts for survival. On second thought, no it's not...a lot of people just will be sheeple. As far as Abraham-Hicks goes, well, it's a fact that Esther and Jerry started out as Amway distributors and apparently made a fortune selling motivational materials to their downline, which I gather was based on Napoleon Hill's 'Think and Grow Rich'. I suspect that 'Abraham' was born out of Esther's desire to impress Jerry, but that is just my opinion and does not change the fact that some mighty profound words have come pouring out of her mouth while 'channeling'. You have selected some of her most boring and uninspired words to quote here, although I guess it serves the purpose of this article. Esther herself is not a healer, nor is she a 'mystical thinker' (she has claimed she is not much of a thinker at all), and 'Abraham' (who refer to themselves in the plural rather than the singular - Esther is the one who gave them the name 'Abraham') do not promote the idea of 'healing' at all. They have stated that the intention to heal is in fact putting your attention on illness by pushing against it, and suggest instead that one make peace with wherever they currently are and when they have done that to then create a clear and vivid mental image of where they want to be and to infuse it with as much passion as they can muster, and to practice this passionate visualizing every day for a few days and then to relax and do whatever actions they are inspired to do. And of course there will be some, like Jerry, who, in making peace with where they are, realize that they are no longer interested in remaining in the 3D at all. And of course there will be others who think that nobody should ever die or allow themselves to experience a negative emotion... I just say good luck to them, hahahaha! For what it's worth, all the quotes were taken from the attached video which was selected because it dealt with James Ray and his relationship to the LOA. The healing issue just happened to come up in the same piece and took me off on a tangent. If you are ever able to find a recording of Jerry asking about coming complete with this life, that you mentioned in the other thread, I would love it if you posted it here.